The oh so common question “What on earth do I do with all this pulp? ?” because as I’m sure you’re not surprised I love juicing, but it doesn’t mean I’m not annoyed having to throw out all the pulp. So I decided to start researching all the different things you can do with juice pulp, and there are a lot! People are super creative I love it, and I’ve gathered them all together here in this article. 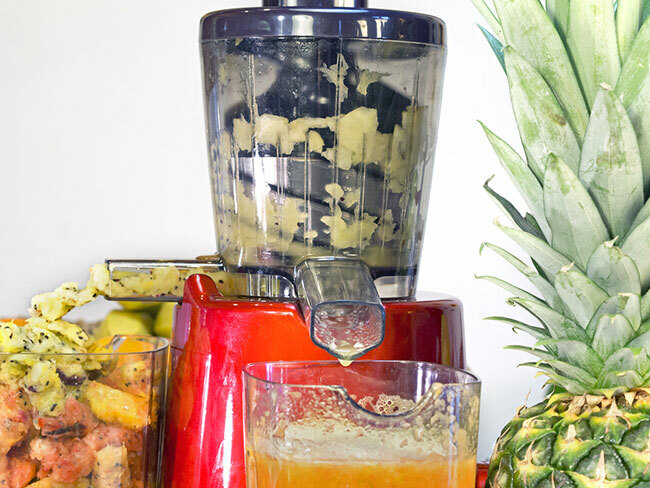 I hope it helps you find some creative uses for your juice pulp. There are some things you can only make with fruit pulp (or that you’d only want to make with fruit pulp) likewise for vegetables and there are some things you can use either or both types of pulp for. So I’ve tried to organise the list roughly into uses of fruit pulp, uses of vegetable pulp and of course uses for any pulp. Let’s start with vegetable pulp, why you ask? Because you have to start somewhere so why not here. There’s a lot of cooking you can do with vegetable pulp, it’s quite easy to put it into other things to bulk them out and add in some extra flavour. You can just straight up substitute whatever you normally use as filler in your burgers for vegetable pulp. In beef burgers, if you normally use breadcrumbs you can just leave them out and use the same amount of dry pulp instead. It adds a little extra filler plus some fibre and bonus nutrients! Or if you are making vegetarian/vegan I know that using carrot or sweet potato pulp works really nicely in black bean patties, you can use whatever pulp you like of course but those two in particular, are really nice. You probably won’t get enough in a single batch but you can collect it in the freezer along with any other vegetable scraps you have to make really delicious vegetable stock. Or you can add it to chicken stock or any other bone broth you might be making. When you’re making it yourself don’t forget to add salt! But add it near the end so you don’t over season it, if you add enough for when the pan is full by the time it simmers down and reduces it will be way too salty. But not the point here (as much as I want it to be), the point is you can add vegetable pulp straight into the eggs while they’re cooking, you don’t want to do this with wet pulp but if it’s fairly dry then this works really nicely. Or cakes or cupcakes for that matter, Carrot pulp into a carrot cake can work for instance. As for recipes, there are too many to choose from but the easiest ones are ones like this vegan oatmeal where you can just add pulp as an extra ingredient. If you use carrot they’ll become sweeter so you can always take out some of the sugar if you’d like. Alternatively if you’re not that familiar with baking and don’t trust yourself to substitute here’s a recipe for juice pulp muffins. This is nicest with carrots (there’s definitely a carrot pulp theme going on here…) just put some red lentils into a crockpot then add your leftover pulp and water, mix in some salt, garlic and black pepper and let it cook for a few hours and you’re good to go. Plus you can actually make this with frozen pulp too! 6. Feed It To Your Chickens? Bit of a slim chance of this being helpful to you but if you have chickens or know someone who does you can feed the pulp straight to them, just sprinkle it out with their usual feed and they’ll enjoy it. Plus anything they don’t eat will just fertilize the ground it’s on (assuming your chickens are kept on grass of some kind and not a parking lot or something strange). So a fruitarian are you? Or maybe you enjoy vegetable juice but have enjoyed my witty remarks through this article so much you’re still reading. Most likely neither of those is true, but regardless of that here are the uses I found for what to do with fruit pulp. Unlike vegetable pulp fruit pulp can actually be quite tasty just by itself. Or you can mix it in with some natural yoghurt for a really tasty treat. Eating it as pulp is nicest if it’s still a bit wet, so if you have a really good juicer you might actually struggle to eat the pulp because it’ll be so dry. But that means your juice extracted every last bit of goodness so it’s no big waste. And hold your trousers up the eco-friendly way. Ok not that kind of leather, fruit leather is really tasty and a really nice snack for a kids lunch box (or a grown-ups lunch box, I’m not judging). It involves spreading the pulp onto a baking sheet, you can add some sweeteners beforehand if you want, then leave it in the oven on the lowest heat it can go for several hours (anywhere up to 12!). So it’s not the most efficient way to make a small layer of fruit but it’s quite fun to do as a treat, and very satisfying to cut it out and make your own fruit roll-ups. This was an interesting one I thought, I came across the recipe on Get Rawcous, It basically involves using the pulp to bind together a load of different ground up seeds which then get smushed (that’s a very technical cooking term) together to create a flat pizza dough which gets dehydrated. This one I really liked, you add the pulp to a little bit of water and pour it into an ice cube tray, then when you’re next making a frozen smoothie you can use these ice cubes to get an extra thick smoothie that’s perfectly chilled. Alternatively avoid the bother of freezing it first and add the pulp straight to your smoothie, this is good if you’ve added to much liquid and it’s come out a little runny. A few big spoonfuls of pulp thicken it up and make it really tasty. Can be done with vegetable pulp too but thought the fruit pulp was probably more versatile. You can actually put the still wet juice pulp straight onto your skin as a face mask, just leave it there for a few minutes and wash it off and see how you feel. Not everyone likes it but I know many people love how refreshed there skin feels afterwards. These are the few things you can do with either type of pulp for the recipes it’s a matter of taste whereas for composting you don’t have to decide anything, you can just put it in regardless. Composting is the easiest use for juice pulp, so if you have a compost bin in your garden you can just throw the pulp you don’t use into that. 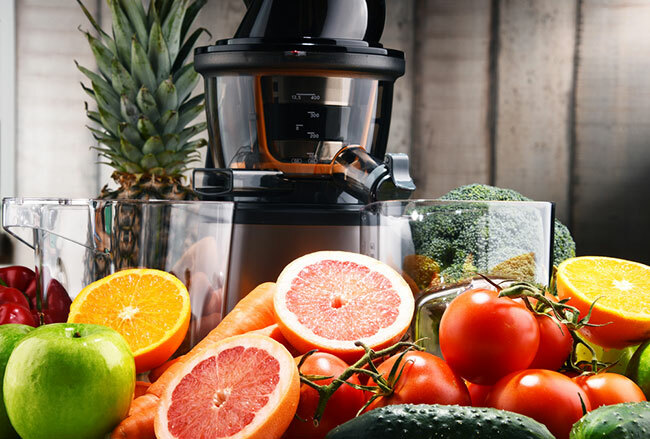 Even if you do some of the other things on this list if you’re having a lot of juice you probably won’t manage to use it all so you can put the leftovers into compost. But if you don’t have space for a compost bin outside you can use a bokashi bucket which is an in kitchen composter. 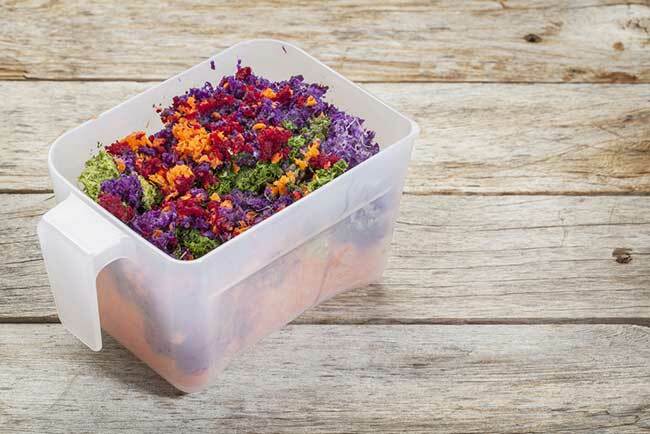 It works by piling kitchen scraps (such as pulp) and layering it with something called an inoculated bran, that just activates the composting process, you fill it up and leave it for 10-12 days and you have a small bucket of compost. I put this into the both section because I know of some people who like a sweet cracker made with fruit pulp but generally it’s vegetable pulp all the way. Mix 3 cups of pulp, 1 cup of water, ½ cup of almond/coconut flour and ¼ cup of chia seeds. Spread it all out as thin as possible on a baking sheet (note that it will be very stiff, try covering with a baking sheet and pressing that if you’re having trouble spreading it). Bake at around 350F for 30 min or till brown and smelling toasted. Take it out and cut it before it cools otherwise it just crumbles. You can add any spices you feel like to the dough at the beginning, try salt, pepper and garlic or if you’re using fruit pulp cinnamon. Enjoy! I love sweet pancakes so it’s fruit pulp for me all the way but you can make some really nice dinner pancakes by adding vegetable pulp. Real simple too, just take your normal pancake batter, and throw in some pulp! Mix it up and cook it as normal, how much you add is up to you, start with some mix it in and add more if you think it’s looking like it’s lacking. Some dogs will just eat the pulp as is, others get very bad gas if you do this, it really depends on your dog. Also please don’t give your dog anything that could be harmful to it, so absolutely no onions or grapes. I don’t imagine you’re juicing onions very often but I wanted to say regardless. If you have 3-4 cups of juice pulp just add in ½ cup of peanut butter, 1 cup of oats and ¼ cup of ground flax seed, roll into 1 inch balls and cook for an hour at 300 turning once halfway through. You can mix it with your hands and pro tip, rub some olive oil on your hands first and you won’t get as much of the mixture stuck on your fingers.